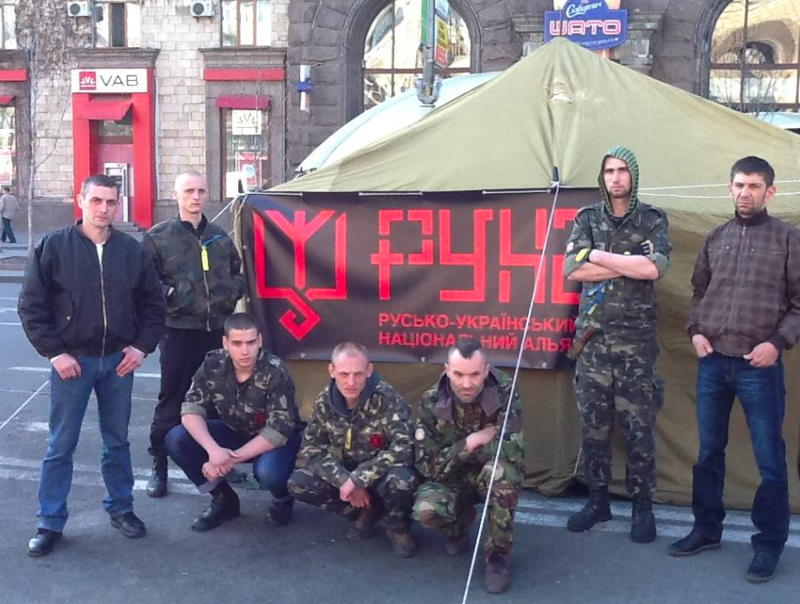 Russian volunteers returning home from Donbas will bring the deadly Maidan virus to Russia. We continue our series of interviews with participants in the Ukraine conflict, starting with a conversation with the DNR [Donetsk People’s Republic] activist Aleksandr Matyushin, Russian Monitor’s correspondent Victor Larionov interviewed the representative from the “Maidan” side, Igor Garkavenko. Although at first glance there are differences in their positions, it is striking that these people have a lot in common, even at the level of their biographies. Igor Olegovich Garkavenko was born in Kharkiv in 1974. In 1996, he tried to take part in the Chechen War, which aroused the suspicions of the Russian side in his attempts to escape from criminal responsibility in Ukraine. He was denied. Garkavenko later showed that if he could not get into someone else’s war, he would create one at home. He created an underground organization, the Ukrainian People’s Revolutionary Army. The small group has carried out some attacks against a range of enemy organizations: UNA-UNSO, RUKh [the Movement], Prosvita [Enlightenment], the Israeli Information Centre. Then he was arrested, charged with terrorism and given a nine-year sentence. He was released in 2006. At various times he maintained separate relationships with political forces in the Russian sector like PNP [People’s National Party], NBP [National-Bolshevik Party], the “Pamyat” society, RNU [Russian National Unity]. He supported Maidan. He is Head of the Russian-Ukrainian National Alliance organization (RUNA) that was formed during the events on Maidan [Independence Square, Kyiv]. He is a poet, philosopher and writer. Russian Monitor: Igor, what do you feel about what is happening now in Eastern Ukraine? Garkavenko: How can I feel about the fact that Russians are killing each other from opposite sides of the barricade? I have a very negative attitude towards it. It is the most tragic situation I have faced in my whole life. I have always hoped that it would never happen, but it was possible to suppose it could. But it has happened and we have to take sides. Unfortunately it is not possible to sit on the fence. If someone is in a fight they have some right, at least they are doing something. In this situation I can say one thing: the national Revolution of the Russian world could happen on either side of the border. If it had happened in Russia, I would have considered it my duty to be there. When there were mass demonstrations about the falsification of the elections in 2012, I was ready to go to Moscow because I thought something clean, genuine, patriotic and revolutionary might come of it. Because the regime [that is currently] in charge of Russia is identical to the one that was overthrown here in Ukraine. It has no relationship to the people, or the nation which it is supposed to be representing. So that if these processes started there, they would cross the border in some way or another and spread into Ukraine. In turn, what started here will definitely cross the border and enter Russia. This will be visible even on a stylistic level. Many things will look just the way they did on Maidan. The same trajectory of events, their internal structure, will be formed in the same way. Maidan is the worst nightmare of any bureaucracy, police state or dictatorship which rests on corrupt structures and unprincipled bayonets. Maidan took place and was victorious. At least the first objective was reached–the dictator was ousted. Just as a virus can be defeated only when its cell is seeded in some experimental conditions, by artificial means it has to be infected and then the cell will die. So, only when all three stages of the process are finished will it be possible to vaccinate the organism with its corpse, which has already gone through these three stages alongside it. And it will be strong enough to overcome it. This is why Maidan is a virus cell called a “national revolution,” and here in Ukraine, it is now in its developmental environment. As Egor Letov sang about the field of experiments, that’s how the “Russian experimental field” at a given moment, became the center of Kyiv, became Maidan. And this is where this virus cell started. It is a deadly threat to the post-Soviet bureaucracy, tyranny and the oligarchy. This cell was seeded under the guise of the dictatorship of Yanukovych, presented as Russian reality in miniature, it passed its life cycle length of more than four years and it was killed, elegantly, beautifully, and aesthetically pleasing. They didn’t save it, neither the cops, nor Berkut [riot police] could help save it, nor could attempts to buy it off, or divide-and-conquer techniques, or other such nonsense be of any use. Of course Putin understood that everything that was happening on Maidan directly concerned him and Russia. This was the death of the post-Soviet political reality, which became clear in all its beauty here in the center of Kyiv. When the revolution occurs against the government, it is like a clash of plasma coming up against something frozen solid. A solid is unable to resist plasma; plasma, as the cumulative shot, penetrates the armor and burns everything inside. The only way to defeat a revolution from without, or at least to postpone it, propping up the government, is to start a war. To turn the plasma of the revolution into something hard, firm, “autonomous.” That is, to turn it into a state. That is why for his own safety Putin did the only thing he could do. I would also like to add that the Ukrainian revolution has identified a new mechanism, which it would seem has been long forgotten in our time. Who could have imagined that a group of guys from the backstreet could decide that they are the country’s Security Service, that they are the Interior Ministry or that they are the real Armed Forces. And on an equal dialogue with those who are patented government representatives, all those in the Interior Ministry, the SBU, the Armed Forces, and such. And not just have dialogue as equals, but also to impose their will, to win over and convince those around them that this is what they are. That some man in a worn out camouflage jacket, from some tent would be able to negotiate with the President, with the person for whom millions have voted. To issue ultimatums and even more so–to chase him out relying only on a handful of people with plywood shields, sticks and bicycle helmets. And that instead of a “court” that can be bribed or the decision dictated from a telephone, another kind of court could work instead. One that doesn’t care about the content of an Article in the Criminal Code or the Code of Criminal Procedure, according to whose decision a thief or a looter can have his face smashed, be beaten up and have the word “thief” written in black coal on his forehead, thrown over the barricade where an ambulance will take him away. These are quite different forms for the expression of the will of the nation or of the people. And they were fulfilled here, they were brought to their logical conclusion–until the president fled. But they are still active. Now, [people] are trying to direct them, into a channel; they are trying to cheat it, bribe it, swindle it as they did before. But this is not the Orange Revolution as it was before. That’s why I think it will be continued. Regardless of in which direction this counter wave was launched, they themselves released all these powerful mechanisms which will inevitably start to shatter the foundations of the Russian Federation itself. Rightly considering Maidan as a direct threat to his existence, by a fateful irony, Putin did everything [in his power] to bring his methods to each Russian, and put his confirming signature under his own recipe. And, if on this side people allowed themselves to lynch the bureaucrats or the butchers from the Interior Ministry, there on the other side where this impulse was given by the Kremlin, they are also permitting themselves instead of long court sessions, written subscriptions of house arrest, investigations, to just take and hang on an aspen tree the Interior Ministry employee that gave the order to open fire on members of one party or another. Therefore, regardless of which side of the barricades here in Ukraine these popular revolutionary mechanisms are working, in the eyes of most people they are already confirmed and look more attractive than all the artificial, abstract, lifeless, inorganic, unlimited police force (all that that now exists on the other side of the Russian-Ukrainian border). Therefore, I am sure that regardless of what the Russian bureaucrats are trying to achieve, a living, cleansing people’s revolutionary spirit will soon be knocking at their door. Putin has let this popular revolutionary genie out of the bottle himself. Russian Monitor: How do you see the outcome of the conflict in the East? Garkavenko: It seems to me that Putin has betrayed Donetsk and Luhansk. However, he has to save face on some bad game so he will continue to secretly support the pro-Russian forces, send prepaid Chechen mercenaries from the “Vostok” battalion in KAMAZ trucks filled to the brim, and so on. But, apparently, Russia has started to give up this region, and that is why Ukraine must deal with such resistance. A lot of volunteers are joining the battalions on a wave of national patriotism, they are travelling to the east. Yesterday I gave a lecture to a unit which should already be in Donetsk Oblast [region] this evening. I was struck by their enthusiasm. When I asked one of them about their pay, he thought for a moment and said: “Somewhere in the region of 1,000 Hryvnias [USD $89], and maybe for a year.” So we are dealing with a purely ideological position. Today they go to fight on the periphery against Chechen professionals [professional mercenaries], they go feeling behind their backs a demoralized, betraying, sabotaging hole in the faces of the “new” Kyiv authorities. They know that they have an enemy on two sides, but nevetherless they still press on selflessly to conquer the external enemy and then return home to solve the problem on the home front. So I think that without a direct military intervention by Russia they will cope with their task, and then this heroic blood will necessarily flow into all the structures of the new Ukraine. And Ukraine will have to change because for the first time access to the social elevators will not be for the Majors or swindlers but the heroes of Maidan, the heroes of the first Ukrainian War, the War of Independence. And they will change this country one way or another, however much they were hidden, or kept aside, or betrayed, or fooled at the elections, as it happened the last time, despite the fact that their participation in the overthrow of Yanukovych was the biggest and practically the only [valuable component]. When they return as heroes from this war, they will take their due. There is also another important aspect. As I already said the revolution in Ukraine didn’t take place by handing out buckwheat [Ed. note–goodies] at elections, but thanks to the dedication of people prepared to go to the end, ready to die but not retreat until the victory. In an effort to counteract some of this energy of Maidan, Putin had to appeal to something identical, he needed to use dedicated, honest people, who are able to fight and really hate their enemies. And Russia, who for money and handouts voted at the elections, which went to wretched rallies of 200 people, that Russia cannot be directed against everything that was born in the center of Kyiv. Here, another Russia was needed, with as much thirst for righteousness, heroism, enemy blood, weapons–only these manifestations could counter what was born on Maidan this winter. And this energy, awakened by him, was thrown against Ukraine, and now, before our eyes, its own creators betray this same passion. And when, one way or another, in Ukraine everything will be finished, and as I have already said I think Ukraine will win, well then all these passionate people, both the locals and the volunteers that came from Russia, will bring the same deadly Maidan virus which they in fact earlier were overthrowing, back to Russia. Russia, which was once asked not to put checkmarks [on the ballots], not to come to Red Square and clap–but was asked to shed its blood for an idea–she no longer wants to be the same as she was before. So when these people don’t succeed in fully drinking Ukrainian blood, they will search for this blood once they return to Russia. And amongst those pulling those triggers in Russia, will be a lion’s share of fingers which pulled the triggers shooting into Ukrainian heroes today. So the real Russian Spring is yet to come. This entry was posted in "Voices" in English, English, Others, South&Eastern Ukraine and tagged #Garkavenko, #RussiaInvadesUkraine, #SaveUkraine, Maidan, people's revolution, Putin, Russian spring, Ukraine. Bookmark the permalink. 2 Responses to Russian volunteers returning home from Donbas will bring the deadly Maidan virus to Russia.